"This recipe came from my nonna who immigrated from Italy at 40 and members of my family have been making it for years. It is the best! I hope you enjoy it. My fiance said I should sell it! Lol!" Beat water, olive oil, yeast, sugar, and salt together with an electric mixer until evenly combined, about 2 minutes. Add flour, 1 cup at a time, stirring with a wooden spoon after each addition, until dough almost comes away from the sides of the bowl. Knead the dough with your hands until soft and smooth. Lightly oil a bowl and place dough in the bowl, flipping to coat all of the dough. Let dough rest for 5 to 10 minutes. Water should be hot-to-the-touch on your wrist before mixing into dough. I have let the dough rise much longer than 5 to 10 minutes and just punch it down when I am ready to use it. To bake, preheat oven to 400 degrees F (200 degrees C). Roll dough onto a baking sheet or pizza stone and add your favorite sauce and toppings. Bake pizza until dough is cooked through and cheese is melted, 20 to 25 minutes. 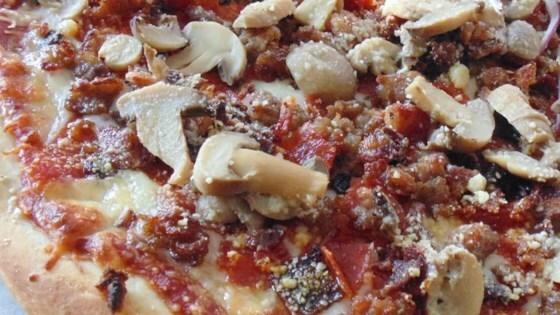 I like to make pepper, mushroom, and bacon topping. Fry 1 green and 1 red bell pepper in olive oil until soft but still a little firm. Then fry the mushrooms until cooked. Fry bacon as well. Place peppers, alternating the colors, and mushrooms on top; finish with bacon. My first time for making yeast dough. Result was good, but turned out like a soft white bread crust. I let it rise for 30 minutes before dividing into two 12 inch pizzas. Just 2 more cups of flour (as the submitter noted) and you will have the chewy crust you are looking for! This is so good, so quick, and so easy! You've gotta try this one! Definitely had to add more flour but it still earns 5 stars for the end result. A nearly perfect restaurant quality texture, crisp on the outside while soft in the middle.